Scionon™ is a New Zealand based company started by Ian Adams. Ian has over 30 years of experience in the wider horticultural industry having started a career in horticulture upon leaving school. Ian was able to work his way up to orchard ownership, but for various reasons ceased as a grower following the 2001 season. Subsequently, he went on to managing orchard operations for a large packing house operator until early 2005. He then reactivated his grafting business and began building it up his own nursery while working at another local nursery. Ian has always made use of his extensive propagation skills gained over years of experience in the horticultural industry. Seeing the need to increase productivity and efficiency, he developed a unique range of grafting tools to assist with scion preparation and assembly. These tools have been commercially available since 2009. The hand held Grafting Shears and bench mountable Graft Crafter are unique in that they are capable of cutting ‘whip & tongue’ grafts (and many other graft types) without the use of a knife, enabling unskilled persons to prepare these technically difficult grafts with ease. These devices have already given a great pay back even within Ian’s own contract propagation business. The Scionon™ range of grafting tools are a new concept in how grafting can be approached. They are of extremely high and durable quality and are the only grafting tools available that successfully replicate the knife cut, therefore eliminating damage to the cambium layers when grafting. The tools enable novices as well as experienced propagators to cut and assemble a wide range of grafts over a wide variety of materials. These tools have been developed to cover many grafting and budding applications and are extremely versatile in the operating range and material that can be prepared. They have already been used to graft many fruiting and ornamental varieties and species. The tools are capable of performing the following cuts: whip & tongue, cleft, wedge, and rind grafts and chip & ‘T’ buds. They operate in the 1/8” to 1” (3mm to 25mm) scion wood diameter range depending on the product supplied. In addition to the many plant species already worked with, Scionon™ tools are being tested on other plant materials and exploring more cutting options as different horticultural industry needs become known. To date Scionon™ tools have successfully been used to prepare pip and pome fruit (apple, pear, and quince), summer stone fruits (apricot, plum, prune, cherry, peach, nectarine, and almond), cane/vine (kiwifruit and grape), exotics (olive and avocado) and ornamentals (acer, ash, elm, gleditsia, robinia, walnut and flowering cherry). They can be used to field or bench graft. They have also been tested them on citrus, roses and maple. Scionon™ products are promoted and sold in New Zealand, Australia and Europe, and have also been supplied to Asia, Bermuda, Canada, Russia, Turkey, Uganda and the US where they have been evaluated by leading fruit growing companies and nurseries. We also receive numerous enquiries from other Countries. 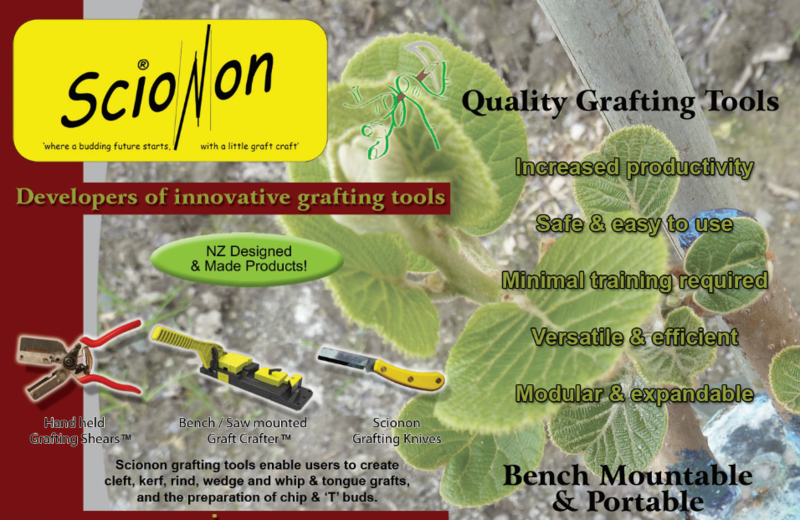 Scionon™ is a recently established New Zealand company specializing in the development of innovative grafting tools of which Mr. Adams is a founding director.